Two bikes were very special indeed: one was a lovely race Honda RC45 which is apparently an ex-David Jefferies and Richard ‘Milky’ Quayle machine. So it’s probably the old Medd sponsored machine perhaps from 1996, although now it’s wearing HRC house colour race bodywork – but it’s still a very special looking machine. The other machine to catch the eye was a thing of great beauty and possibly the best-looking two-stroke ever made: Yamaha’s YZR500. 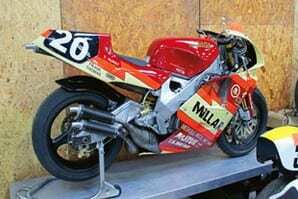 This bike was one of those bought and run by Joe Millar in the early to mid 1990s. Joe was a big sponsor of Irish racing talent and the first to buy a customer YZR500 back in 1990 for the 1991 season with Eddie Laycock on board. In the mid-1990s Jeremy McWilliams was battling the likes of our own Niall Mackenzie for title of top privateer aboard this bike. The RC is probably worth somewhere in the region of £30,000, with the YZR around the £100,000 mark.